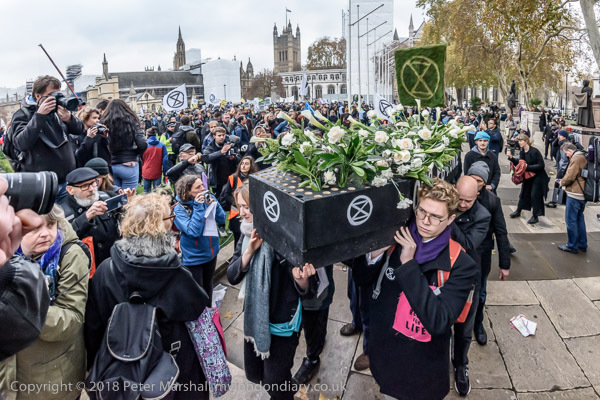 The coffin was carried off of the grass in Parliament Square and to the roadway in front of Parliament, where slowly the protesters formed up behind it. A short flight of steps at the back of Parliament Square enabled me to photograph it looking down and to show the large crowd in the square behind. Using the 16mm fisheye gave me a usefully wide angle of view (about 147 degrees horizontal) which meant including at left the lens of a photographer standing next to me at the top of the steps. 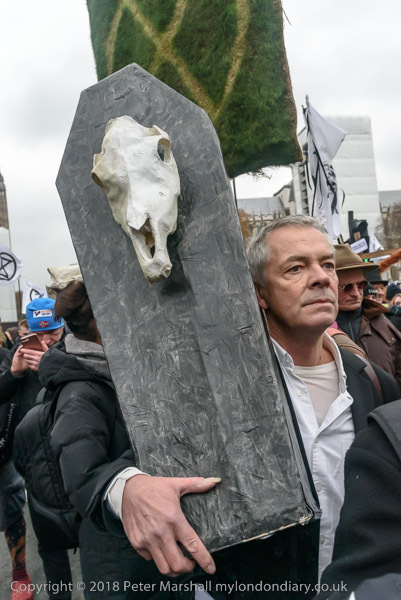 One man had brought a coffin of his own, complete with an animal skull, and another protester had a similar skull on her head, and there were plenty of other creative placards and artifacts. Others carried flowers. It was raining slightly as the march went up Parliament Street into Whitehall and many put up umbrellas, though I found none to photograph with slogans on them. When the front of the funeral march reached Downing Street, there was a sit in for around 10 minutes, followed by some loud shouting of slogans as they got up and moved on. I let the front of the march go on and waited for others to pass, wondering if there might be other actions taking place in Whitehall. 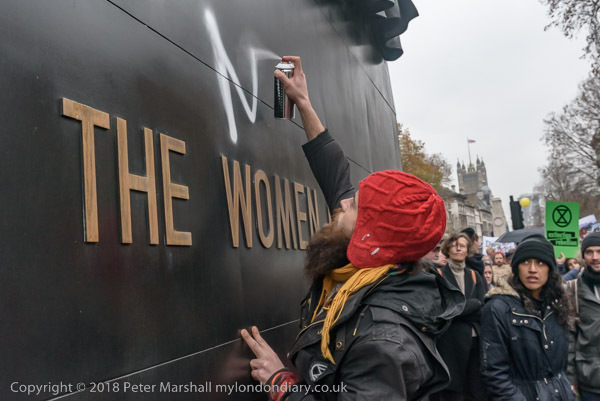 As I stood next to the memorial for the Women of World War II, a man got out a paint spray and began painting a slogan across it. He gets as far as ‘MOTHE’ and tries to write an ‘R’ as a police officer grabs him, and he is led away and arrested. 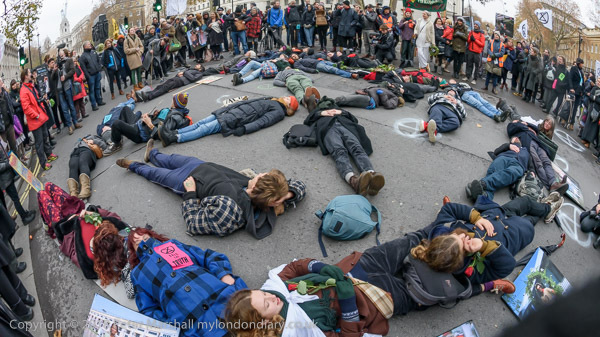 I turned back to the crowd still outside Downing St, and see they are standing around in a large circle round a circle of people lying on the ground. Inside them are other bodies making out the double triangle ‘hourglass’ symbol, completing the XR symbol, which has also been chalked or painted on the roadway in several places. I held the 16mm fisheye as high as I could above my head and took a number of pictures. By using this on the D750 (rather than the D810 which has a fixed rear screen) and working in Live View I was able to swivel the rear screen and have a good idea of the framing. For once the curved horizon adds to the image. Unfortunately I forget to switch from ‘movie’ to ‘still’ mode in Live View, and so get a 16:9 frame rather than the normal ’35mm’ 1.5:1, an annoying feature of the camera. Others are writing on the walls in Whitehall – and getting arrested for it. 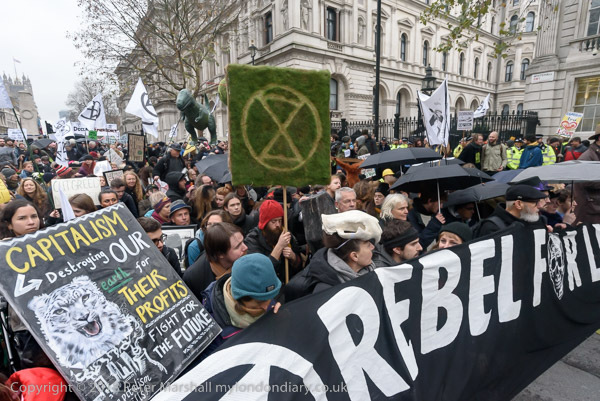 Many of those taking part in Extinction Rebellion are deliberately seeking to be arrested, working on the hope that large numbers of arrest give the protests a higher public profile and may prod the authorities into doing something about the problems. The front of the protest halted at the top of Whitehall, for me and the other protesters to catch up with them, before setting off under Admiralty Arch (now owned by a hotel company) and along the Mall towards Buckingham Palace. A few police try to stop them, but are ordered back to allow the protest to go through – and on to the next stage in the protest. 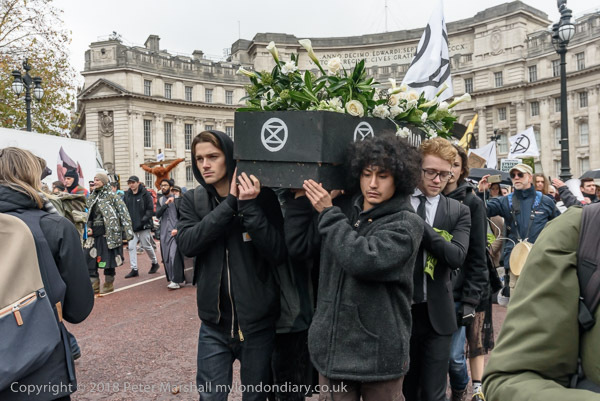 Many more pictures at Extinction Rebellion Funeral Procession. This entry was posted on Thursday, January 24th, 2019 at 08:47 am and is filed under My Own Work, Photo Issues, Political Issues. You can follow any responses to this entry through the RSS 2.0 feed. You can leave a response, or trackback from your own site.